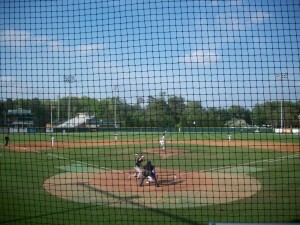 Ballpark Basics: A collegiate ballpark with a nod to its school’s history. Ballpark Breakdown: Plumeri Park opened in 1999 on the campus of William & Mary and is named after alumnus and former Tribe baseball player Joseph Plumeri II whose donations to the university helped build the complex. Located north of the main campus along with additional athletic fields (soccer/lacrosse, tennis courts). Since there are a number of athletic fields near Plumeri there is quite a bit of parking. Upon entering the main entrance there is a long driveway that takes you past one of the practice fields to the main parking area. However, many people just pull up on the grass of the practice field and walk across driveway to the entrance of the park (we highly recommend this method). On the inside it looks like many other collegiate ballparks. 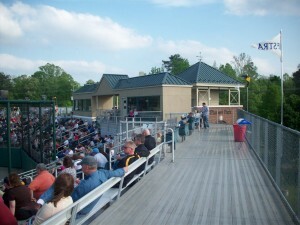 There is seating behind the home plate with seat backs while bleacher seating stretches down the baselines behind the dugouts. There is a small press box ( so small in fact that a number of press members sit outside of it). There is a small concourse that wraps around the top of the seating area with flags from each school in the CAA Conference represented. The outside of the seating area at Plumeri Park is wrapped in brick so it fits in with the historic buildings on the W&M campus (a college that has been around since 1693). The front of the park also contains a brick façade with iron that wraps into the W&M emblem. It has gone through some slight renovations since it opened up in 1999. 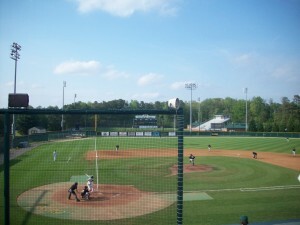 They added a new scoreboard before the 2005 season and future renovations included an artificial turf halo behind home the home plate area, new benches in the dugouts and new padding on the backstop. It went through another renovation in 2011 when they regraded the entire field to help with drainage issues. 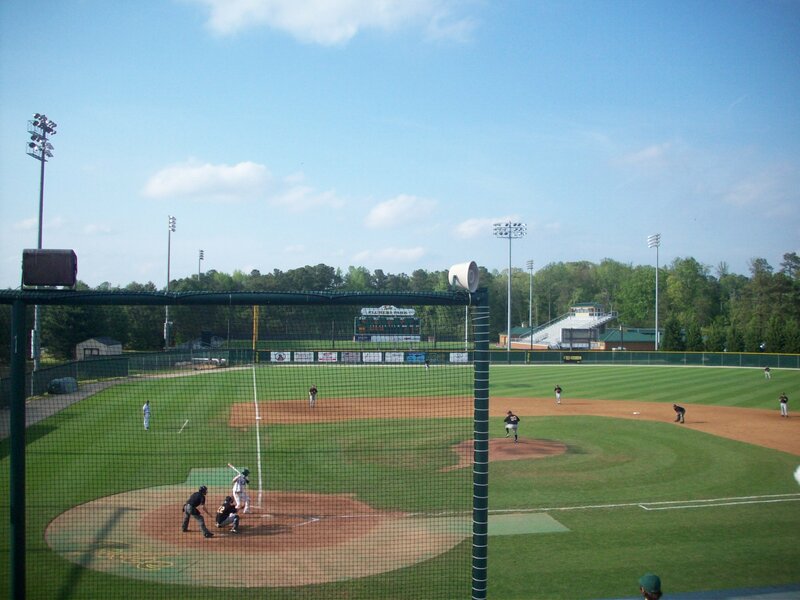 Only being used by the College of William & Mary as well as the occasional high school team there is obviously no alcohol sales at Plumeri Park. There is a small concession stand underneath the grandstand that has your typical ballpark fare. 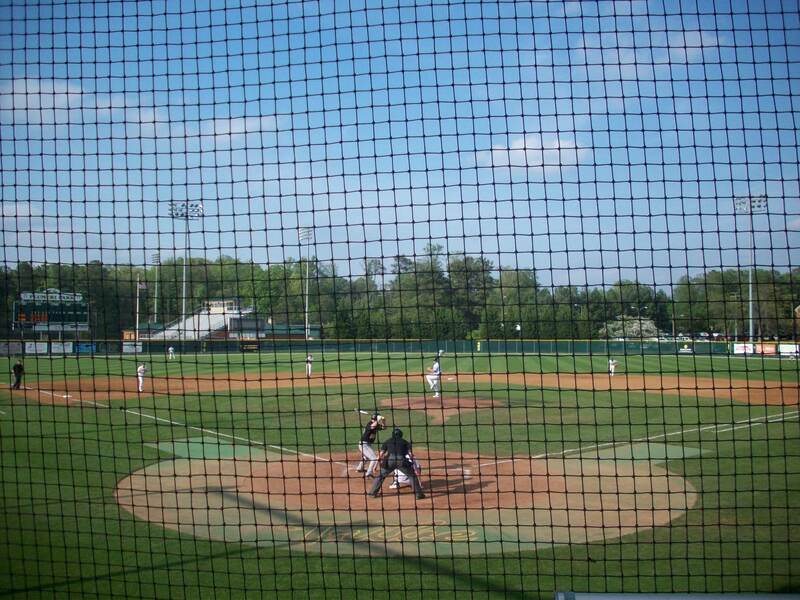 While there is nothing special to make Plumeri Park stand out from other collegiate ballparks it is still a nice place to take in a game. With historic Colonial Williamsburg a short drive away it is not a bad idea to add a game to your weekend of sightseeing. 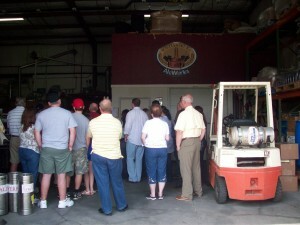 Brew Basics: A brewery that works with what they’ve got to produce a lot of different styles. From the outside, the building that houses Williamsburg Alewerks brings to mind “medical complexes” of the 70’s, kind of a brown strip mall of varying offices. The hops growing up the side of the building let you know you’re in the right place, and a tasteful wooden sign (mounted to a bourbon barrel), in keeping with Historic Williamsburg style, also helps point the way. You enter into a small room that is used for all it’s worth. 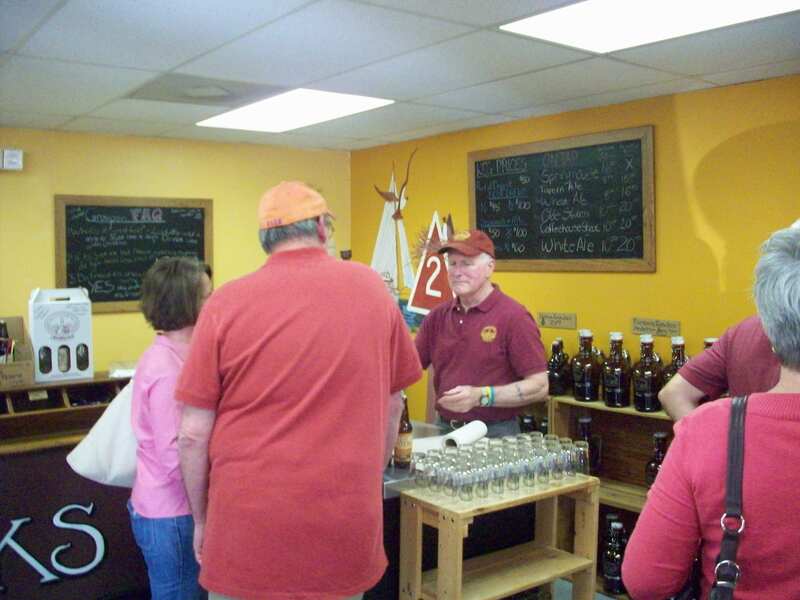 It is packed from floor to ceiling with beer cartons sold by the case, 12 and 6 packs, growler, bottle and yes, you can even mix your own six!, t-shirts and other Alewerks merch, wall decor and -on any given day – people. Somehow they have still managed to fit in a few stainless steel topped bar areas, one used for sales, the tastings to cost here but you can keep the glass – and one with taps for tastings and growler fills. We have stopped by here more than once, but had occasion on our last visit to be there when a 2-for-1 tasting and tour Groupon was getting set to expire and the place was hoppin’. Obviously the staff was swamped, but they managed to keep everything together and organized, and even stayed on top of who was ready for the next beer in the tasting line up. The tour consists of a quick walk through their brewhaus, which is housed in a garage and includes the usual mash tuns and brite tanks, but in this case also includes a huge barreling room stocked (again) from floor to ceiling. They may be small, but they really maximize what they’ve got, and their Barrel House line is among the most popular of the brews they produce, so the more they can get fermenting, the better. Although we (of course) prefer free tastings, the one here really is worth it. The beer is good, but the staff really takes the time to point out the differences in the beers you are drinking, and explain the process that goes into creation. Happily they seem to assume at least a rudimentary knowledge of beer, so they don’t just stick to the basics like many other tours we’ve participated in. This town is just about 45 minutes from us, so their beers are readily available nearby, but they produce so many seasonals and specials along the way that we just can’t keep up. 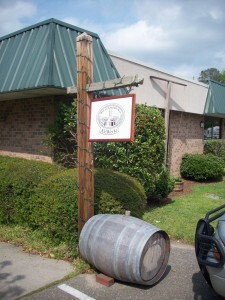 There are many we would still like to get to (see “pretty much anything from the Barrel House” or the “Ebenezer”, or the “Bitter Valentine”…) but as you can see our list isn’t too shabby. And if there is one that you’ve had that you think we should check off our to-do list, please let us know! White Ale (4.5% ABV) – The White Ale is the spring seasonal from Williamsburg Alewerks, and the lowest ABV of any of the beers on this list; which is worth noting because most of their beers have a fairly high alcohol content, so take your time! It’s a thick, unfiltered beer with a strong golden wheat color and a bouquet of wheat and flowers. The White Ale is highly carbonated and full-flavored having a somewhat floral body and citrus finish. Williamsburg Wheat Ale (5.6% ABV) – Very different from the White Ale (surprisingly) this beer is honey colored and slightly thicker. The aroma is malty, earthy and slightly dry. It too has strong carbonation, a solid body and more character and substance than many a wheat beer that we have tried. Chesapeake Pale Ale (5.7% ABV) – Though the Chesapeake is similar in color to the Williamsburg wheat, that is where the similarities end. This one is bitter, hazier and not as much carbonation. The aroma is faint and sweet, the taste is rather watery and then just bitter. Not their best. Drake Tail IPA (7.3% ABV)- Just a shade darker than the Chesapeake, which is just a shade darker than the Williamsburg Wheat, so kind of a warm honey color. No sweetness to this aroma. The hoppiness is there, but the bitters are much more balanced than they were with the Chesapeake, and the other flavors are allowed out. Although overall it does seem very similar to the others we had sampled up to this point. Red Marker Ale (5% ABV) – Much darker than the first four beers, cola colored beer that showed ruby when held up to light. The carbonation appears lighter in the glass, but is still fairly strong when held in your mouth. Brown sugar aroma and just a hint of coffee that is faint but there in both aroma and palate. A smooth and not terribly complex beer that is slightly malty. Pumpkin Ale (7.3% ABV) – Probably the most obvious seasonal in our beer list. This is the fall option is a plain brown color and the smell is not so pumpkin/spicy as you get with many of this genre but it is Very Nutmeg. The taste is in-you-face slamming. Heavy, pungent with almost no actual pumpkin but such sweet, strong spice you can almost feel the ground spices on your tongue. Tavern Ale (6% ABV)- Very dark, like chocolate soup (note to self – Chocolate soup: concept to attempt later?) with lots of roasted aroma. The beer is thick like a porter but the Tavern Ale is actually their nut brown. It has a good malty palate that builds to a solid coffee swallow. Coffeehouse Stout (5.4% ABV)- The third and final of the annual seasonals, available each winter. To start it smells like iced coffee and is actually made with Guatemala Antigua beans. It is a bit of a thinner beer, but the taste is strong, bitter and dark. At first sip you will notice the malts, but as the flavor builds the coffee takes over and is even more pronounced after the swallow. This was Jim’s favorite, which if this is not your first visit here, should not really come as much of a shock.